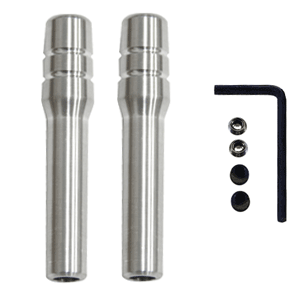 Replace your cracked factory door pins and upgrade the appearance of your interior with UPRs Billet Aluminum Slimline Locking Door Pin Kit. These kits fully adjustable in height so you can set it and forget it. The locking set screws hold the position and make it impossible to be stolen. 1990 1991 1992 1993 1994 1995 1996 1997 1998 1999 2000 2001 2002 2003 2004 2005 2006 2007 2008 2009 2010 2011 2012 2013 2014 LX GT GTS Mustang Cobra Shelby Roush Saleen & Steeda Vehicles. No one else can stack up to the bold clean styling of our aftermarket Billet dress ups, Street Strip & Racing Suspension & Performance Parts for your late model American Muscle Car!